Biosolids is the final product created through multiple processes and scientifically-advanced treatment of sewage sludge. 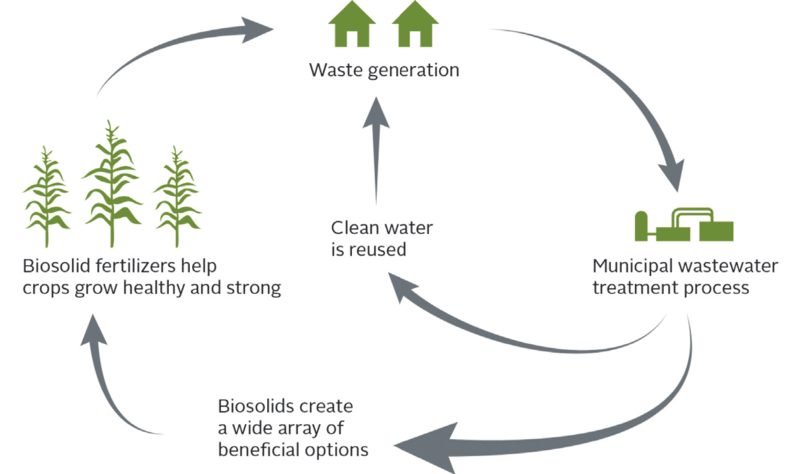 Generated by thousands of publicly-owned municipal water treatment facilities all across the country, biosolids are safe to recycle and rich in plant available nutrients. 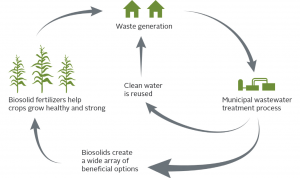 Since every community of any size must process the wastewaters generated by its population, recycling biosolids for added benefit to agriculture and horticulture makes sense. Biosolids can be safely applied to soil as a fertilizer and/or soil conditioner to improve and maintain agricultural and forest lands as well as to restore damaged acreage. Created during the past 30 years, the biosolids process has resulted in the rapid and remarkable cleansing and restoration of America’s rivers and streams. What About Pathogens in Biosolids? The potential for exposure diminishes as environmental conditions such as heat, sunlight, desiccation, and other microorganisms destroy pathogens that may be present in biosolids. As noted by the National Research Council of the National Academy of Sciences, there have been no reported outbreaks of infectious disease associated with exposure to properly treated and utilized biosolids. What do “Class A” and “Class B?” Mean? Class A: Class A biosolids undergo a “Process to Further Reduce Pathogens (PFRP).” Pathogens are reduced to a level similar to the native soil and environment. Class A biosolids products can be used on home lawns and gardens, parks and golf courses, and other places where public contact is likely. 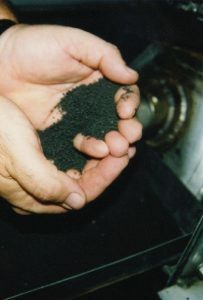 Class A biosolids products include composted biosolids, lime pasteurized biosolids, and fertilizer pellets. Class A biosolids products are sometimes ingredients in soil amendments, potting soils, and slow-release fertilizers. Class B: Class B biosolids undergo a “Process to Significantly Reduce Pathogens (PSRP).” This means that while pathogens are significantly reduced to levels which are often below those found in animal manures, additional best management practices (BMPs) are required at the site where they are used. Class B biosolids are used in bulk as fertilizers in agriculture and forestry and to reclaim barren lands. Site permits are required for Class B biosolids use. Is biosolids recycling safe? How do we know? Yes! Federal and state standards and management practices for biosolids recycling were developed from a detailed scientific risk assessment completed by the U.S. Environmental Protection Agency (EPA). Input included research and expertise from the U.S. Department of Agriculture and premier universities including the Universities of Arizona, California, Colorado, Florida, Maine, Michigan, Massachusetts, Minnesota, New Hampshire, Oregon, Vermont, Washington, and Colorado State, Ohio State, Penn State, and Cornell Universities. Will the use of biosolids adversely impact nearby surface waters and/or groundwater? water or groundwater quality. As with any fertilizer or soil amendment, best management practices must be followed to prevent impacts via surface water runoff or via leaching to groundwater. By law, biosolids recycling programs must follow such best management practices; the same is not true for the use of manures and chemical fertilizers. Numerous biosolids recycling programs have caused documented improvements in the quality of surrounding water bodies. How? By enriching soils and helping vegetation grow more vigorously. This results in reduced soil erosion and stabilization of on-site contaminants that had previously contributed to stream and groundwater pollution. There are different rules for different classes of biosolids. Class A biosolids are highly-processed and contain no detectible levels of pathogens. Once processed, Class A biosolids that meet strict stabilization requirements and low levels metals content may be sold as a fertilizer or soil conditioner Class B biosolids are treated to destroy 99.99% of the monitored organisms, but as with many soil amendments, contain detectible levels of pathogens. There are buffer requirements, public access restrictions, and crop harvesting restrictions for virtually all forms of Class B biosolids. Will the value of my property be adversely impacted if biosolids are used in my neighborhood? No. Studies have shown that biosolids are beneficial. By using biosolids, farmers and other landowners are managing the nutrients and processes on their properties more carefully and responsibly than the average landowner. In addition, those who use biosolids may be benefiting from a more efficient fertilizer option and helping their farm fields or other open lands to be more profitable. The more profitable their operations are, the more likely it is that farmers and other landowners will keep their properties green and open for the neighborhood to enjoy. Some biosolids products can create unpleasant odors, but many do not. Most Class A biosolids products (e.g. compost, fertilizer pellets) are basically odor free or have a slight earthy smell. Some bulk Class B biosolids products have odors similar to animal manures used to fertilize farm fields. As with manures, when bulk Class B biosolids are land applied, some odors are possible, but they are temporary. How can I know that biosolids are being properly managed? Most wastewater treatment facilities are public and share their testing and process information willingly. You can learn more about biosolids recycling by contacting you local wastewater or biosolids treatment facility or the U.S. Environmental Protection Agency (USEPA) website www.epa.gov.